ISTANBUL (Sporting Alert) — Kevin Durant scored 24 points in leading the Oklahoma City Thunder to a 95-82 preseason victory over Fenerbahce Ulker on Saturday as they start preparation for the new NBA season. 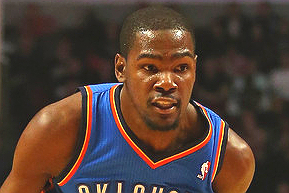 Durant, who shot 50-percent from the field on 9 of 18 shooting, also pulled down eight rebounds, and three assists in the victory. Serge Ibaka finished with 15 points, six rebounds and four blocks for the Thunder in the win at the Ulker Sports Arena, in Istanbul. Oklahoma City is without All-Star point guard Russell Westbrook, who remains on the sidelines, recovering from knee surgery, so Reggie Jackson starts in his position. “Good learning experience (for the team),” Thunder coach Scott Brooks was quoted as saying. Leading the way for Fenerbahce Ulker was guard Bojan Bogdanovic, who had 19 points in the defeat, as only he scored in double digits for the home side. Durant and the Oklahoma City Thunder return to action on Tuesday night against fellow NBA outfits, Philadelphia 76ers at Phones 4U Arena in Manchester, England.